If you're on a mission for a casual yet totally stylish ensemble, pair an Iris von Arnim round neck ribbed jumper with light blue embroidered jeans. Both items are totally comfy and will look fabulous together. Add a glam twist to your getup with light blue leather heeled sandals. If you're looking for a casual yet totally stylish look, consider wearing an Iris von Arnim round neck ribbed jumper and black skinny jeans. Both garments are totally comfy and will look fabulous together. This pairing of an Iris von Arnim round neck ribbed jumper from farfetch.com and a black leather mini skirt is clean, chic and super easy to recreate! Up the cool of your getup by finishing off with black heeled sandals. 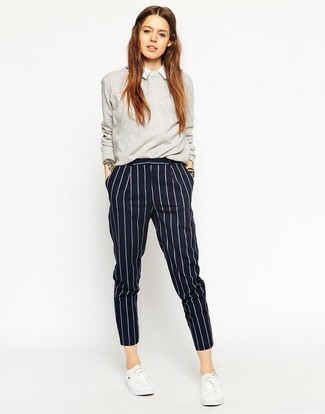 If you're on the hunt for a casual yet totally stylish look, wear a grey crew-neck sweater with navy vertical striped dress pants. Both pieces are totally comfy and will look fabulous paired together. White low top sneakers will add a sportier vibe to your ensemble. If you feel more confident wearing something comfortable, you're bound to fall in love with this totally stylish combo of an Iris von Arnim round neck ribbed jumper and grey dress pants. Black leather wedge ankle boots work wonderfully well within this ensemble. Choose a grey crew-neck sweater and grey flare jeans for an effortless kind of elegance. Up the ante of your getup with black suede lace-up ankle boots. A grey crew-neck sweater and green dress pants is a savvy pairing to carry you throughout the day. Kick up the cool of your outfit by rounding it off with brown leopard leather pumps. 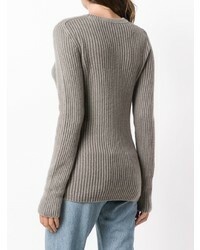 If you're on a mission for a casual yet totally chic outfit, pair a grey crew-neck sweater with charcoal dress pants. Both garments are totally comfy and will look fabulous paired together. To bring out the fun side of you, complement your look with white leather low top sneakers. 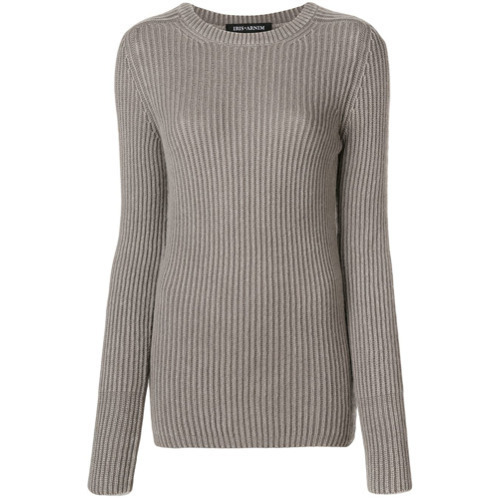 If you're hunting for a casual yet totally chic look, reach for an Iris von Arnim round neck ribbed jumper from farfetch.com and white skinny jeans. Both garments are totally comfy and will look fabulous together. For something more on the daring side to complete this getup, rock a pair of pink rain boots.